For other uses, see Skirt (disambiguation). 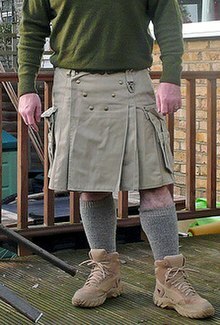 In the western world, skirts are more commonly worn by women; with some exceptions such as the izaar which is worn by Muslim cultures and the kilt which is a traditional men's garment in Scotland and Ireland and sometimes England. Many fashion designers, such as Jean Paul Gaultier, Vivienne Westwood, Kenzo and Marc Jacobs have shown men's skirts. Transgressing social codes, Gaultier frequently introduces the skirt into his men's wear collections as a means of injecting novelty into male attire, most famously the sarong seen on David Beckham. Other cultures traditionally wear skirts. 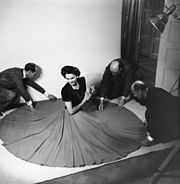 At its simplest, a skirt can be a draped garment made out of a single piece of fabric (such as pareos), but most skirts are fitted to the body at the waist or hips and fuller below, with the fullness introduced by means of darts, gores, pleats, or panels. 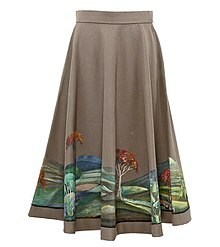 Modern skirts are usually made of light to mid-weight fabrics, such as denim, jersey, worsted, or poplin. Skirts of thin or clingy fabrics are often worn with slips to make the material of the skirt drape better and for modesty. Skirts were worn since prehistoric times. They were the simplest way to cover the lower body. Pants were not at hand for a very long time. A straw-woven skirt dating to 3.900 BC was discovered in Armenia at the Areni-1 cave complex. Skirts were the standard attire for men and women in all ancient cultures in the Near East and Egypt. The Sumerians in Mesopotamia wore kaunakes, a type of fur skirt tied to a belt. The term "kaunakes" originally referred to a sheep's fleece, but eventually came to be applied to the garment itself. Eventually, the animal pelts were replaced by kaunakes cloth, a textile that imitated fleecy sheep skin. Kaunakes cloth also served as a symbol in religious iconography, such as in the fleecy cloak of St. John the Baptist. Ancient Egyptian garments were mainly made of linen. For the upper classes, they were beautifully woven and intricately pleated. Around 2,130 BC, during the Old Kingdom of Egypt, men wore wraparound skirts (kilts) known as the shendyt. They were made of a rectangular piece of cloth wrapped around the lower body and tied in front. By the Middle Kingdom of Egypt, longer skirts, reaching from the waist to ankles and sometimes hanging from the armpits, became fashionable. During the New Kingdom of Egypt, kilts with a pleated triangular section became fashionable for men. Beneath these, a shente, or triangular loincloth whose ends were fastened with cord ties, were worn. During the Bronze Age, in the Southern parts of Western and Central Europe, wraparound dress-like garments were preferred. However, in Northern Europe, people also wore skirts and blouses. In the Middle Ages, men and women preferred dress-like garments. The lower part of men's dresses were much shorter in length compared to those for women. They were wide cut and often pleated or gored so that horse riding became more comfortable. Even a knight's armor had a short metal skirt below the breastplate. It covered the straps attaching the upper legs iron cuisse to the breastplate. Technological advances in weaving in the 13-15th century, like foot-treadle floor looms and scissors with pivoted blades and handles, improved tailoring trousers and tights. They became fashionable for men and henceforth became standard male attire whilst becoming taboo for women. Skirts are still worn by men and women from many cultures, such as the lungi, lehnga, kanga and sarong worn in South Asia and Southeast Asia, and the kilt worn in Scotland and Ireland. One of the earliest known cultures to have females wear clothing resembling miniskirts were the Duan Qun Miao (短裙苗), which literally meant "short skirt Miao" in Chinese. This was in reference to the short miniskirts "that barely cover the buttocks" worn by women of the tribe, and which were "probably shocking" to observers in medieval and early modern times. In the Middle Ages, some upper-class women wore skirts over three metres in diameter at the bottom. At the other extreme, the miniskirts of the 1960s were minimal garments that may have barely covered the underwear when seated. Costume historians[who?] typically use the word "petticoat" to describe skirt-like garments of the 18th century or earlier. Beginning around 1915, hemlines for daytime dresses left the floor for good. For the next fifty years fashionable skirts became short (1920s), then long (1930s), then shorter (the War Years with their restrictions on fabric), then long (the "New Look"), then shortest of all from 1967 to 1970, when skirts became as short as possible while avoiding exposure of underwear, which was considered taboo. However, a long skirt provided privacy when women needed to relieve themselves in the open. Skirt is a part of uniform for girls in many schools across the world, with length of skirt varying as per local culture. The pleated tartan skirt has been a component of girls' school uniforms since the early twentieth century in UK. In the 21st century, skirt has become part of Western dress code for women and is worn as business casual and office wear, and also as sportswear (ex. in tennis). Skirt may also be mandatory as formal wear, such as for airhostesses, waitresses, nurses and military women. A full skirt of blue damask (back). Ethnographic region: Żywiec. Collection of The State Ethnographic Museum in Warsaw. Culottes, a form of divided skirt, split skirt or pantskirt constructed like a pair of shorts, but hanging like a skirt. Divided skirt, see under: Culottes. 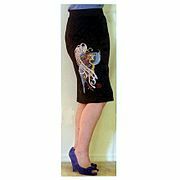 Gored skirt, a skirt that fits through the waistline and flares at the hem. May be made of from four to twenty-four shaped sections. Dates from the 14th century and much used in the 19th century. 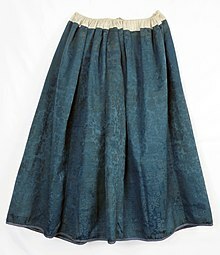 Very popular in the late 1860s, mid-1890s, early 20th century, 1930s, 1940s, and now worn as a classic skirt style. 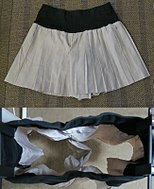 Inverted pleated skirt, a skirt made by bringing two folds of fabric to a center line in front and/ or back. May be cut straight at sides or be slightly flared. Has been a basic type of skirt since the 1920s. Pencil skirt, see under: Straight skirt. Underskirt, simple, basic skirt over which an overskirt, or drapery, hangs. Bubble dress/skirt, (also called tulip skirt or balloon skirt) a voluminous skirt whose hem is tucked back under to create a “bubble effect” at the bottom. Popular in the 1950s. Dirndl skirt, (durn′del) a skirt in the Bavarian-Austrian dirndl style, made of a straight length of fabric gathered at the waist. The style derives from Tyrolean peasant costume. Godet skirt, (go-day’), a skirt with triangular pieces of fabric inserted upward from the hem to give more fullness. Popular in the 1930s. Maxi skirt, an ankle-length daytime skirt, popular with women in the late 1960s as reaction against miniskirts. Midi skirt, skirt with hem halfway between ankle and knee, below the widest part of the calf. Introduced by designers in 1967 as a reaction to very short mini skirts. Squaw dress or fiesta dress, a one or two piece outfit based on Native American clothing. Fashionable in the 1940s and 50s. Swing skirt, flared skirt, circular or cut in gores, fitted at hips with a wide flare at the hem. Popular in the late 1930s and at interval since. Very popular in the mid-1980s. Tulip skirt, see under: Bubble skirt. The fustanella is a full-pleated skirt worn by men in Greece and other parts of the Balkans. By the mid-20th Century, it was relegated to ceremonial use and as period or traditional costume. It is worn by the Evzones, or Evzoni (Greek: Εύζωνες, Εύζωνοι, pronounced [evˈzones, evˈzoni]), which is the name of several historical elite light infantry and mountain units of the Greek Army. Today, it refers to the members of the Presidential Guard who parade the presidential mansion wearing a short version of this historic costume. The hakama is worn in Japan. There are two types of hakama, divided umanori (馬乗り, "horse-riding hakama") and undivided andon hakama (行灯袴, "lantern hakama"). The umanori type has wide and divided legs, similar to culottes. Some hakamas are pleated. Aside from the wearing of kilts, in the Western world skirts, dresses, and similar garments are generally viewed exclusively women's clothing which, historically, was not always the case. However, Western men have taken up skirts as forms of civil protest. Other Western men advocate skirts as a measure of co-equality between women and men. ^ Harrell, Stevan (1995). Cultural Encounters on China's Ethnic Frontiers. University of Washington Press. pp. 98 & 103. ISBN 0-295-97528-8. ^ Hill, Daniel Delis (2007). As seen in Vogue : a century of American fashion in advertising (1. pbk. print. ed.). Lubbock, Tex. : Texas Tech University Press. pp. 23–25. ISBN 978-0-89672-616-1. ^ Fischer, Gayle V. (2001). Pantaloons & Power: A Nineteenth-century Dress Reform in the United States, page 138. Kent: Kent State University Press. ISBN 9780873386821. ^ Brown, Ian (2010). From Tartan to Tartanry: Scottish Culture, History and Myth, page 177. Edinburgh: Edinburgh University Press. ISBN 0748644490. ^ Yarwood, Doreen (2011). Illustrated encyclopedia of world costume. Mineola, N.Y.: Dover Publications, Inc. p. 376. ISBN 9780486433806. ^ "Social Science a Textbook in History for Class IX as per New Syllabus". google.co.in. ^ Staff writer. "Vivienne Westwood designs". Victoria and Albert Museum. Retrieved 5 June 2015. ^ Evans, Caroline (2004). "Cultural Capital 1976–2000". In Breward, Christopher; Ehrman, Edwina; Evans, Caroline. The London look : fashion from street to catwalk. New Haven: Yale University Press / Museum of London. p. 149. ISBN 9780300103991. ^ Driver, Maggie (21 April 2016). "The squaw dress: Tucson's controversial but unique fashion history". Arizona Sonora News. Archived from the original on 8 January 2017. Retrieved 2018-01-17. ^ "Gho & Kira: The National Dress". Bhutan's Culture. RAOnline. Retrieved 31 July 2010. ^ "The History Of Men & Skirts". Bustle. 22 May 2017. Retrieved 5 Oct 2018. ^ "These Men in Skirts and Dresses Protested Workplace Dress Codes. Lo and Behold, They Won". Bustle. 27 June 2017. Retrieved 5 Oct 2018.